From the mid-17th century to the present day, herding sheep, carding wool, spinning yarn, dyeing with native plants, and weaving on iconic upright looms have all been steps in the intricate process of Navajo blanket and rug making in the American Southwest. 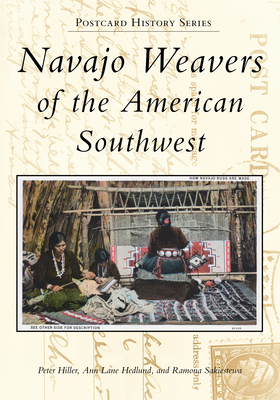 Beginning in the late 1800s, amateur and professional photographers documented the Din (Navajo) weavers and their artwork, and the images they captured tell the stories of the artists, their homes, and the materials, techniques, and designs they used. Many postcards illustrate popular interest surrounding weaving as an indigenous art form, even as economic, social, and political realities influenced the craft. These historical pictures illuminate perceived traditional weaving practices. The authors' accompanying narratives deepen the perspective and relate imagery to modern life.